At installation, Arena includes a set of pages for one newsletter. Review and customize the modules on each page. The following are basic examples of each module. Newsletter page – This is the primary page for visitors and subscribers, which displays a title summary of Newsletter articles to which the user can select. This page is visible in the navigation and requires the Newsletter Promotion Display and Newsletter Subscribe modules. Articles page – This page displays an individual article as well as the archive search tool to allow the visitor to browse previous newsletter volumes and articles. 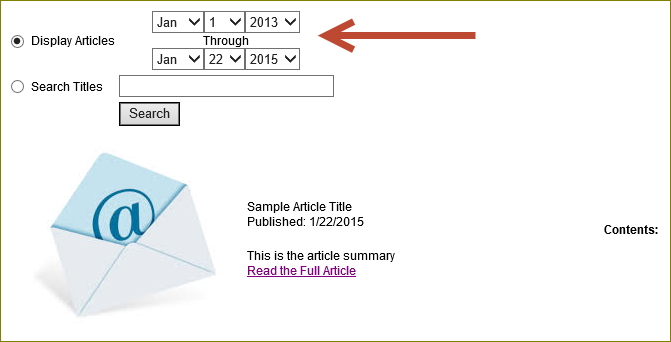 This page should be set to not display in navigation and requires the Newsletter Article and Newsletter Archive modules, with the Archives and Articles pages selected for their respective settings, and a Newsletter ID setting matching the desired ID number. Consider customizing the Tools File module setting to display the tool bar layout. 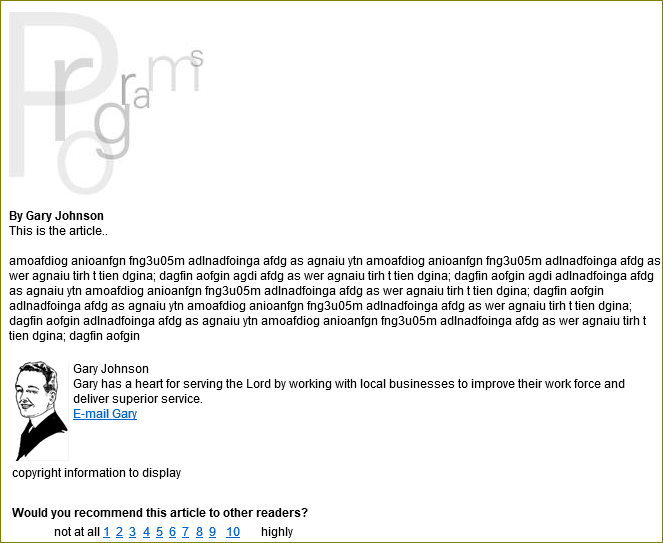 Article Print page – This page displays the article selected with no additional menus or fields to allow for a ‘clean’ printing of the article. 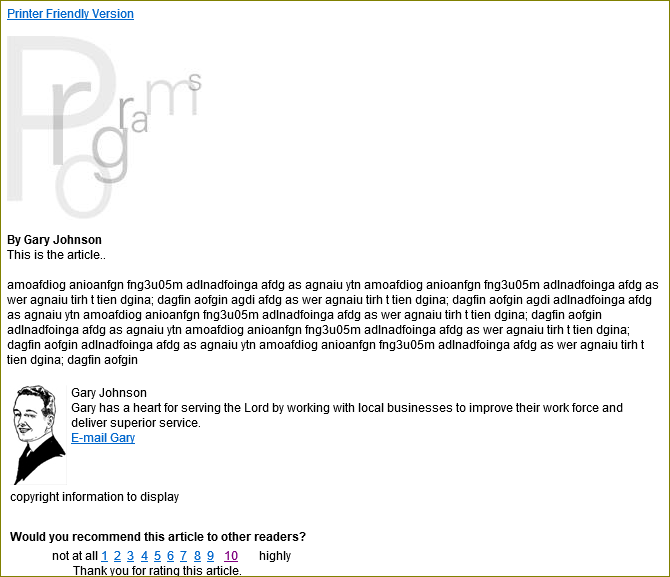 The page requires the Newsletter Article Display module. You need to remove any navigation bars or any other inherited modules from this page. Newsletter Archives page – This page gives users the ability to view the results of an Archive search with links to the resulting articles. 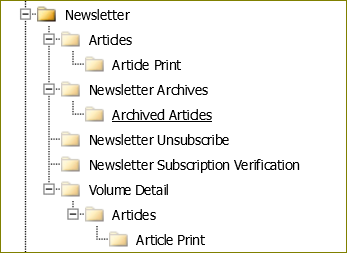 The page requires the Newsletter Archive module with empty Archive Results page setting (as this is the results page) and the Articles page selected, and a Newsletter ID setting matching the desired ID number. If you plan to distribute your newsletter by email, you also need to create the three pages below for each newsletter you wish to publish. Newsletter Subscribe page – This page and module gives visitors the ability to subscribe to your newsletter. 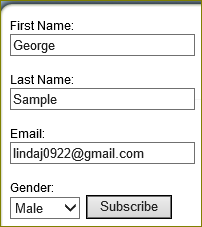 This page requires the Newsletter Subscribe module with the desired Newsletter ID setting and set to Display In Nav. It could be located on the same level as the root Newsletter. Newsletter Unsubscribe page – This page and module gives subscribers the ability to unsubscribe. This page requires the Newsletter Unsubscribe module and has no module settings. This module is to allow users to subscriber to or remove their subscription by clicking the Unsubscribe link in the email they receive. Newsletter Subscription Verification page - This page is not required unless you are publishing your Newsletter by subscription. It is rather unique in that the configuration is nearly identical to the Newsletter Page. The page requires its own template specifically designed to display in emails (thus a simplified HTML code). When you create your Newsletter internally, you need to enter the external URL for this page as the Publish Point for the newsletter. This is the actual page that the subscriber receives in their email. You also need to setup the Newsletter Subscription|Email Verification System Email.